Premises liability, sometimes called simply slip-and-fall law, refers to the liability a property owner has to ensure that the property is safe. If you are injured while on another’s premises, and the injury was preventable through a reasonable amount of care, the owner may be held liable for the injury. Premises liability is a major component of personal injury law, along with medical malpractice, motor vehicle injuries, workplace injuries and injuries caused by defective products. 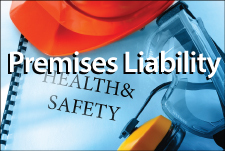 As with these other categories, premises liability cases must be based on negligence. Where do premises liability accidents occur? Who can make a premises liability claim? Anyone with a legitimate reason for being on a property — being a customer or user of facilities — may file a premises liability claim. If you were trespassing on a property and are injured, you are probably not entitled to make a claim. Can premises liability apply to instances of wrongful death? Yes. While nonfatal accidents can result in financial compensation for medical expenses, lost wages, pain and suffering, and disability and disfigurement, fatal accidents can demand compensation for loss of companionship, loss of service and funeral expenses. Is it necessary to file a lawsuit to obtain compensation? The first step is always to file a claim with the owner’s insurance policy. It is only necessary to file a lawsuit if the insurance company is unwilling to settle at an acceptable level. This list of premises liability FAQ includes the most general questions regarding premises liability cases. We invite you to talk to our attorneys about your specific case questions. Call Chambers & Noronha in Santa Ana, California, at 714-558-1400. Or ask our lawyers your questiohttps://www.cnlegalgroup.com/cnlstaging/contact-usns by email.